In the nineteenth century, the First Dodrupchen Rinpoche (1745-1821) sent his main disciple, the Great Mahapandita Shenphen Thaye (born in 1800), to the Holy Dzogchen Area. There, Shenphen Thaye had a vision of the Dzogchen Mahayogi Shri Singha. Shri Singha prophesied future events and instructed him to build a university. Soon after these visions, Shenphen Thaye built the Dzogchen Shri Singha Five Sciences Buddhist University in homage to, and in memory of, Shri Singha. The purpose of the University has always been to promote the Dzogchen spirit in the hearts of all Dharma students and to further the lineage of Dzogchen Nyingthig, which has trained numerous outstanding Sangha members (Buddhist practitioners). Among them are the renowned Vajrayana scholars Khenchen Pema Trashi, Paltrul Rinpoche (1808-1887), Khenchen Pema Dorje, Mahapandita Mipham Rinpoche (1846-1891), Orgyen Tenzin Norbu, and Gyakung Khenpo Zhenga Rinpoche (1871-1927). Gyakung Khenpo Zhenga Rinpoche was the author of the famous commentary on the thirteen Buddhist texts widely adopted by the Nyingma, Kagyu, and Sakya lineages. 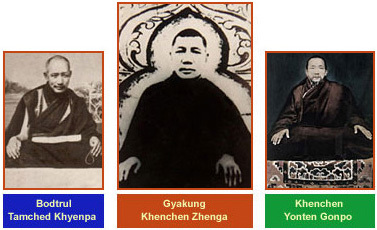 Other scholars included Khenpo Kunpal (1872-1943), Khenpo Ngakchung (1879-1941), Khenpo Thubga, Bodpa Tulku, Abu Lhakhong, Khenpo Tubten Nyendrag, and Khenpo Padma Tsewang. Dozens became Mahapanditas and Mahasiddhas, or achieved Rainbow Body. Moreover, tens of thousands of students of the various Tibetan Buddhist traditions attended this great university. The Buddhist view taught at the University is that of the Dzogchen Nyingthig tradition. The curriculum of study is divided into three sections. The first takes eight years to complete. The second and third each take four years to complete. The annual study of Remembering the Genuine Qualities of the Three Jewels Sutra and Bodhisattva Caryavatara is required. Two-year study of the Pratimoksa Sutras and Shastras of the Shravakayana tradition. Two-year study of the Madhyamika Sutras and Shastras of the Nagajurna tradition, and the Chittamatra Sutras and Shastras of the Asanga tradition. Two-year study of the Prajnaparamita Sutras and Shastras, as well as the Vinaya Sutras and Shastras of the Mahayana tradition. Two-year study of the Guhyagarbha Tantras and Shastras of the Vajrayana tradition. Those who complete this eight-year study will receive a De Nod Dzin Pa degree (equivalent to a Bachelor's degree). Those who manage to complete only part of the eight-year study will receive a Shor Phon degree (equivalent to an Associate's degree). In the second section, students do research on and practice the Kama (original Buddhist texts) and the Terma (Dharma Treasure texts) for four years. These texts are presented with an introduction and commentary by the Vajra master Rongdzom Mahapandita and the Great Natural Perfection Yogi Longchen Rabjampa. Upon completion, the students will receive a Long Rik Mha Pa degree (equivalent to a Master's degree). In the third section, for four years practitioners are specially trained in the View, Meditation, Action, and Fruition of Mahayoga, Anuyoga, and Dzogchen Atiyoga Tantras and Shastras. The practitioners study and practice the seventeen Dzogchen Tantras, the Nyingthig Yabzhi, and the Yeshe Lama Tantras and Shastras. Graduates will receive a Khenpo degree (equivalent to a Doctorate degree). The curriculum described above is established according to the Buddhist views of Longchen Rabjampa, Khenpo Zhenga, and Mipham Rinpoche. Students have a choice of an optional curriculum, i.e., to study any of the five major and minor sciences according to their ability. Students study under professors specializing in each of these sciences. Upon completing these courses, all students are required to take a comprehensive examination. They are tested on their skills in teaching, writing, and debating. Later, students may continue their study and practice and may become Khenchen Triwa or Mahapandita, as determined by the Vajra masters of the Mother Dzogchen Monastery. Graduates may then teach the Dharma in universities or go into solitary retreat. In the early years, Dzogchen Kenchen Zhenga Rinpoche sent many Khenpos from Dzogchen Shri Singha University to establish eighteen different shedras (Buddhist colleges) for the Nyingma, Sakya, and Kagyu traditions of Tibet. 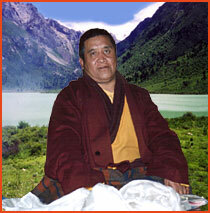 Many shedras found throughout the world today originated from Dzogchen Shri Singha University. Graduates of Dzogchen Shri Singha University also set up thousands of Dharma schools in Tibetan monasteries. In the last hundred years, the University reestablished the summer retreat programs in 130 monasteries. As a result, the tradition of summer retreats has spread throughout Tibet and Asia. The Dharma wheel of the Dzogchen Nyingthig had been turned without interruption for centuries at Dzogchen Shri Singha University. However, in 1959 the university was destroyed and Dharma teachings have been hindered. In the early 1980's, the Chinese government, along with Alak Zenkar Rinpoche, established a temporary Tibetan university at the location of the old Dzogchen Shri Singha Five Sciences University. They invited His Holiness Khenchen Pema Tsewang Rinpoche and twelve other great scholarly Khenpos to teach at the new university. For five years, they instructed hundreds of Tibetan students in the ten sciences of Buddhist education. All of the students were extremely diligent. The graduates of this university now teach in many places. In 1986, His Holiness Tulku Kalsang Rinpoche, H. E. Dzogchen Khenpo Choga Rinpoche, Ranyak Patrul Rinpoche and Arik Gyatrul Rinpoche, together with 170 lamas joined together with the local Dzogchen people to rebuild 344 rooms of the original Dzogchen Shri Singha Five Sciences University. 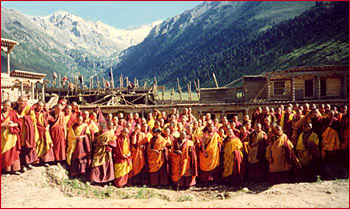 Upon its completion, thousands of lamas came from all parts of Tibet to study. 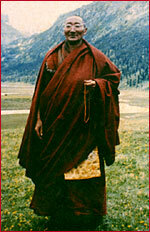 Dzogchen Khenpo Choga Rinpoche taught at and directed the University from 1985 to 1989. Today, more than forty lamas have become Khenpos (professors) and are teaching in many different monasteries and Buddhists colleges. 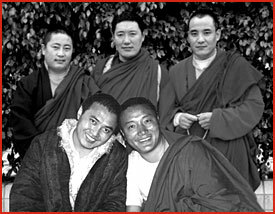 Among those teaching are Dzogchen Chokling, Orgyen Rigdzin, Wongchen Dharge, Dzogchen Paltrul, Khenpo Zhenga, Dawa Tashi, and Kunzang Rigdzin. They teach and provide care for thousands of lamas at the Dzogchen Shri Singha Five Sciences University. In 1996, a large fire destroyed the main building of the University and the rebuilding effort has so far not been completed. Khenpo Dorje Tashi and Dzogchen Chokling rebuilt the southern and western parts of the University. Since then, lack of housing, food, medical supplies, and books, as well as inadequate means of generating electricity have caused many difficulties. 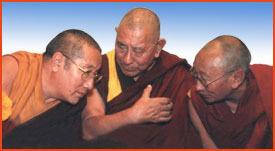 Nonetheless, the lamas maintain tremendous faith and commitment to their study and practice. We hope to improve these difficult conditions and ask your help in preserving the lineage of the Dzogchen Shri Singha Five Sciences University. The expected cost of the reconstruction and operation of the university is about two million U.S. dollars. During the last three years, our master, H. E. Dzogchen Khenpo Choga Rinpoche and Ven. Geydrak Rinpoche have fully supported more than two hundred lamas of Dzogchen Shri Singha University. We hope to continue to be able to preserve the Dzogchen lineage at this critical time by supporting more young lamas in the future. We ask that everyone help to restore the Dzogchen Shri Singha University and to sponsor, or find sponsors for as many lamas as possible. Sponsorship for the basic necessities and education of one lama is only US $30 per month. Our master, Dzogchen Khenpo Choga Rinpoche, puts all his energy into spreading the Dzogchen Shri Singha University tradition, and has founded Dzogchen Shri Singha organizations in many countries. Khenpo Choga Rinpoche works extremely hard every day to fully restore the Dzogchen Shri Singha Five Sciences University. We request that you help us bring this important project to realization. in the Kham region of eastern Tibet.